FarmVille is a new Kenyan game on Facebook where you can grab land, excel in overgrazing farmland and overstocking sheep & cattle, buy luxurious decorations and spend the rest of the time idling with a sundowner in your hand. A report by the KenyaTimes recently revealed that most employees in Nairobi CBD are spending their lunch break in front of computers, playing FarmVille. FarmVille is said to have 9 million users worldwide, a quarter of Kenya’s current population. A personal computer, commonly referred to as an IBM-compatible device, is a machine often see in offices, hidden under a dust cover. The first personal computer was brought to Kenya by an US-American bible translator family in 1979. One employee of Kenya Paraffin, Lanterns and Candles (KPLC) who wants to remain anonymous, told us that Kenya currently experiences a power rationing program due to an excessive use of Facebook. Facebook is a very successful website on the internet (mtandao wa intaneti), often used as a dating site and for subversive political and digital activism. The website includes a microblogging service called “status update” which has recently substituted the blooming Kenyan blogosphere. Another popular microblogging service called “Twitter” (ndege kelele) has meanwhile been condemned by the Government Spokesperson Dr. Alfred E. Neuman who said that “it can not send SMS” to him. In a related matter, Dr. Alfred recently anounced that those without telephone network should sms him directly so that he can forward the matter to the relevant ministry in charge of terrorcommunications. 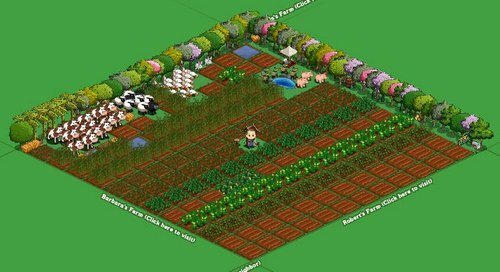 A delegation of Kenyan MPs, who is currently touring the United States, recently wrote a letter to the Office of the President, asking for a national holiday to celebrate FarmVille Day. This, as they explained in their open letter, will also help those urban citizens who have in the past failed to secure their own upcountry shamba due to lack of funds and competition in their extended family networks. A group of young Kenyan writers also published an open letter, claiming that FarmVille actually comes from the United States of America and was introduced to Kenyans by visiting UN interns and PeaceCorps youth who used their daily allowances to access the internet from remote villages. This, as they claim, is “clearly evident as there is no mobile version of FarmVille”. A group of talented programmers from JKUAT is meanwhile working on a mobile version of FarmVille. The project is financed by Sufericom. In other news, a Mr. Kamau from Muranga’a was today injured in a battle with Mr. Ezekiel Oluoch, an official from the National Bureau of Statistics who had approached Mr. Kamau for Kenya’s fifth national census. In a heated debate, Mr. Kamau refused to state the actual number of his lifestock. The fifth Kenya National Census is an inititiative by the GoK to allocate farm land on FarmVille according to family size and fixed assets. In an unexpected move, the World Bank and outgoing ambassadors recently called for a country wide introduction of FarmVille so that no Kenyan will have to suffer from malnutrition in future. I didn’t know Farmville was Kenyan. The cows should be zebu then and the horses could be slender gray Arabs or Barbs! You are a mental case. Its obvious you need help. Lots of it. Excellent. I fear for the blogs, micro-blogging in twitter and Facebook are seriously killing blogging. The number of people participating in blogs are reducing and very soon this could an endangered species like Kenyan Lions and Mau Forest.